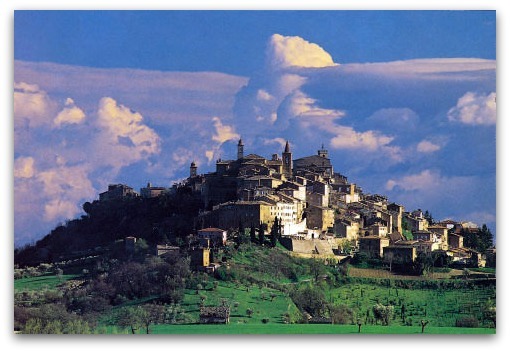 Treia (342m)and Pollenza (341m) are twin towns on hills on either side of the Potenza river and the provincial road that runs through Macerata province. 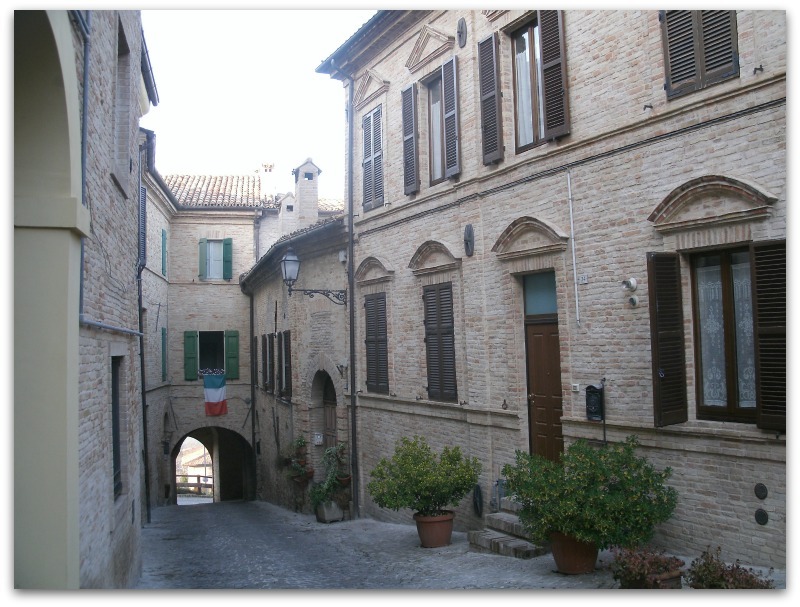 Treia is named by the Italian tourist board as one of the most beautiful villages in Italy and was allegedly founded by the Sabine people in 380 B.C but the first proper evidence dates from a small Roman town named Treia which was recorded as a municipium in 109 B.C. — these remains were found in the valley 2km away and below the current village at SS. Crocifisso: many Roman ruins can be seen in the area. Two large Egyptian religious statues of the Roman period were found there and incorporated into the façade of that sanctuary of SS. 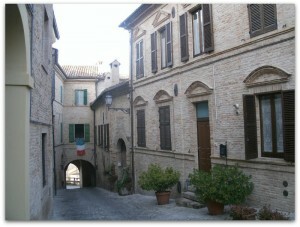 Crocifisso, they’ve since been replaced by copies and the originals are kept in the town’s museum: they are unique in the Marche. The Roman town appears to have been abandoned at the fall of the Western Roman Empire, and only in the 10th century was a new town founded on the top of the hill. Named Montecchio, the town took the side of the papcy during the medieval wars in central Italy, and was overrun several times, particularly in 1239 by Enzio, son and vicar of Frederick II and again in 1263 by Conrad of Antioch, he was later captured at the battle of Vallesacco, and held for several months in Treia in a small gaol (now in use as a café). Montecchio like the rest of the Marches eventually became part of the Papal States, and in 1790 Pope Pius VI rewarded it for its faithfulness by raising it to the official rank of “city”, at the same time it was renamed under its Roman name of Treia. The medieval town of Treia has retained its impressive fortified walls and towers that surround the eliptical shaped hill and it is now home to 9500 people. There are a number of impressive municipal buildings, fortifications and churches, but it is the ancient brick built dwellings of the inhabitants that really add to Treia’s charm. 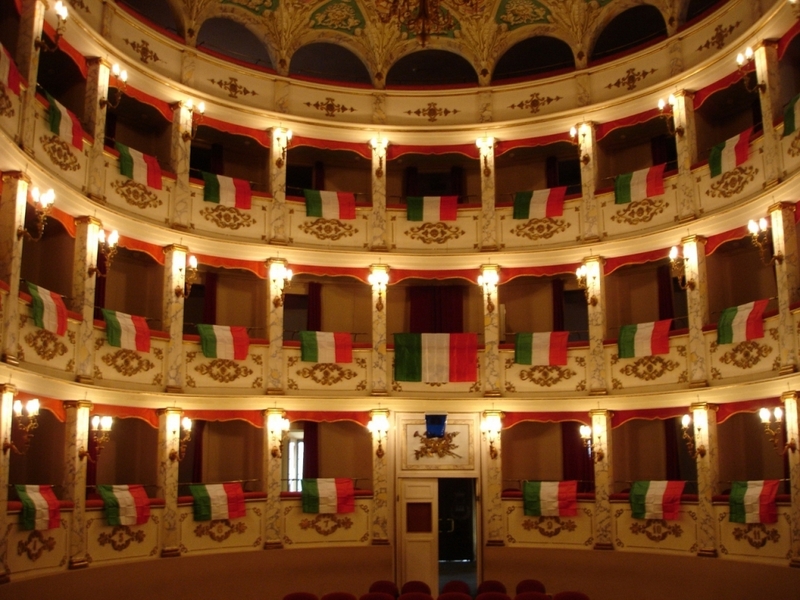 Highlights include the classical-period Palazzo Comunale, the Duomo or Cathedral, the theatre and the wonderful cobbled piazza with its balustraded views of the Marche hills that roll to the hills beyond. But the town itself and the glorious scenery that surrounds it is definitely more than the sum of its parts. 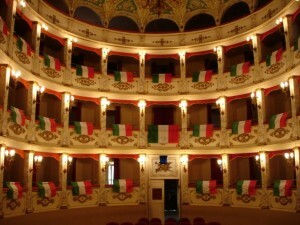 The town of Treia is famous for the annual Disfida del Bracciale, which is played out in the first Sunday of August. This fast and furious ball game dating from Renaissance times is played with three players on each team. Each player wears a fearsome-looking piked cylindrical wooden bracciale, or bracelet, over his hand. This has a flat top and wooden spikes around the side. By hitting the stuffed leather ball over a very high net against the fortified medieval walls with the bracciale, each team scores points against the other until the game is won. The winning team then plays against the winners from the match between the other quartieri of the town to decide the champions. There are usually big boisterous crowds and lots of food and wine and the event becomes an unforgettable spectacle up to the last moment of play, and for long afterwards into the evening.